Crest cup washer screw , will be free of sharp edges since the manufacturing method forms burr upwards, producing a truly flat bearing surface . Mingxing Hardware , has been in the line of fasteners for more than 19 years , produce as per DIN , JIS, ANSI, ISO, or according to custom design . Mingxing Hardware can offer solutions based on customer assemble requirement . Crest cup washer screw stainless steel helps prevent embedding, notching and marring in application and Adapts easily to automatic assembly equipment . Mingxing can produce from M1-M12 MM, equal to 0# to 5/16 inch , in carton steel , stainless steel , brass, copper. Crest cup washer screw stainless steel spreads clamp force over a large area, helping to retain tension even in soft materials. Crest Cup washer screw can be used in any head or thread style, in inch or metric sizes to meet customer specific needs and to offer different solutions . 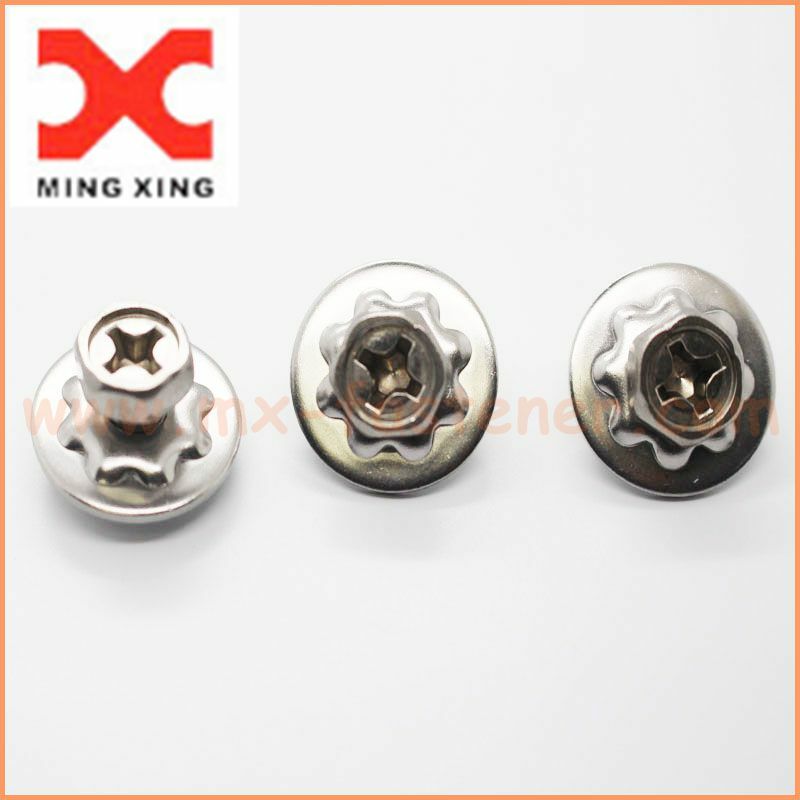 Crest cup washer screw stainless steel , is widely used in stamped broad pentagon shape , also crest washer screw is good to eliminate double washer combinations . Stainless steel is very good in an-ti rust, Stainless steel is notable for its corrosion resistance, and it is widely used for food handling and cutlery among many other applications. Stainless steel is used where both the properties of steel and corrosion resistance are required.Stainless steel’s resistance to corrosion and staining, low maintenance, and familiar lustre make it an ideal material for many applications. The 300 series of stainless steel grades is unaffected by any of the weak bases such as ammonium hydroxide, even in high concentrations and at high temperatures. The same grades of stainless exposed to stronger bases such as sodium hydroxide at high concentrations and high temperatures will likely experience some etching and cracking, especially with solutions containing chlorides such as sodium hypochlorite . 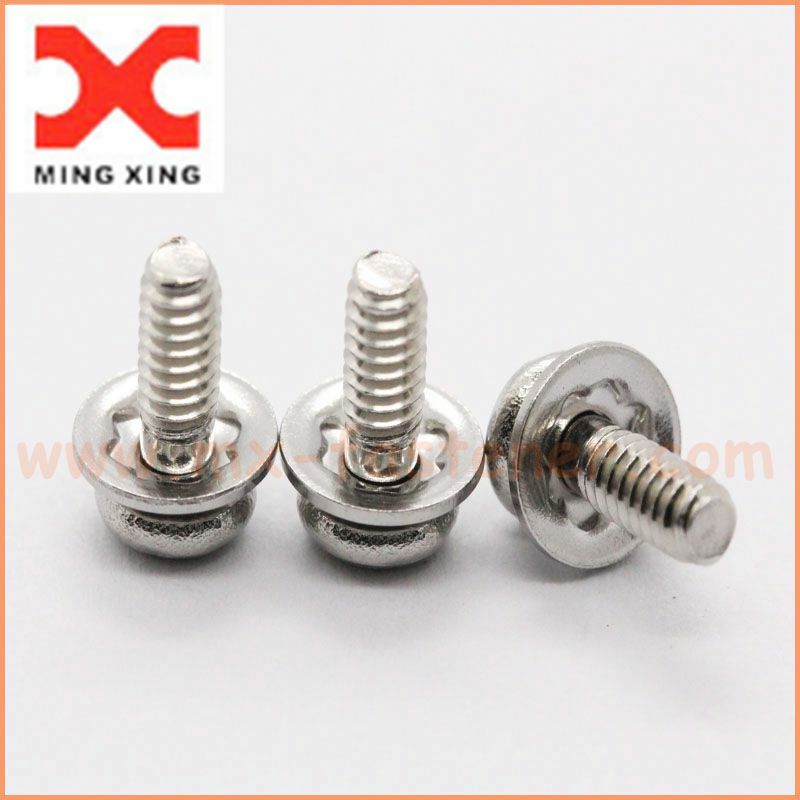 So crest cup washer stainless steel screw is a very good choice .